I never belonged to a sorority. Until now. 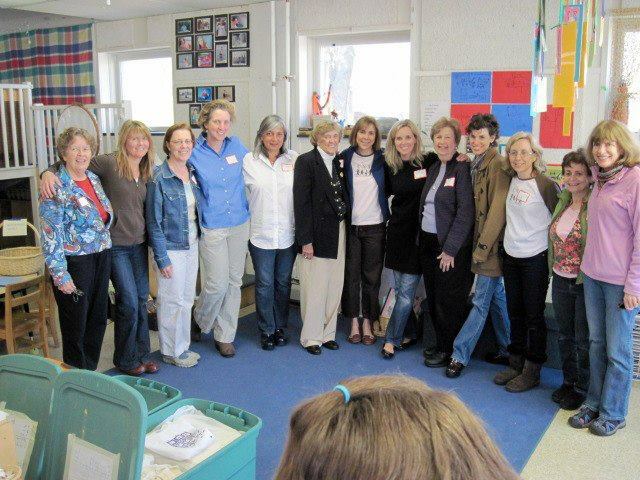 When I landed at CNS in 2000 I found a sorority of women that I call family. I know they will be there for me whenever I need them – in the small moments of a regular morning as well as the big milestones of my life. We have a connection perhaps born of our shared love of the smallest people among us – or perhaps because the sense of community and cooperation lives in our hearts and manifests itself through our work at CNS. Or maybe we’ve just been lucky, inheriting this feeling of comraderie from those who came before us –handing it down to the newer additions to the group. Whatever the reasons, it is a special bond – and continues. I know I can share anything with these women – about my life, my children, my work – and they will listen and absorb, nod and smile, offer me some advice, a story, or best of all, a hug. Tomorrow we gather together to celebrate Barbara Cowen. Our matriarch. Our Queen Bee. Our sister. A woman with an ever present twinkle in her eye. And a spring in her step. I remember when I first met Barbara and it felt like coming home. Transplanted here from a small town – I was searching for new roots and connection. Barbara was the kind of person that made me feel special. She made me feel seen. Her warmth and humility and kindness emanated from her smile. For me, she made this new big town feel small and familiar. She would touch my shoulder in church, smile and pass along that feeling of good morning, so nice to see you. Barbara was fun. She was a dancer, swimmer, bridge player, traveler. She was a mother, grandmother, teacher, friend. She showed up. She listened. And she loved. And she was the most beautiful teacher of young children – and their parents. Mrs. Cowen. With Barbara, perhaps because her teaching spanned almost four decades – wisdom, hope, and patience, just radiated from her. I am grateful for tomorrow. To come together and celebrate the life of Barbara Hayes Cowen. Shoulder to shoulder, my sorority of sisters will sit together, pass the tissues, and share a laugh. Then we will gather at CNS – the place where we all belong – and tell some more stories, pass along a few hugs – and begin the process of goodbye. But Barbara will always live in the walls at CNS. She will always live in our hearts. She once told me when I began teaching in the Front Room that she loved teaching the three year olds the best. She said, “What you see, is what you get.” (meaning that they are without guile, without agenda). And she was right. She was also describing herself. She was just as pure. Just as true. Just as beautiful. I last saw Barbara a month ago at CNS – for an alumni gathering. As we parted and said good night, she whispered in my ear, “Miss seeing you at church”. Well, I’ll see you there tomorrow Barbara. With love in my heart for you, dear soul.